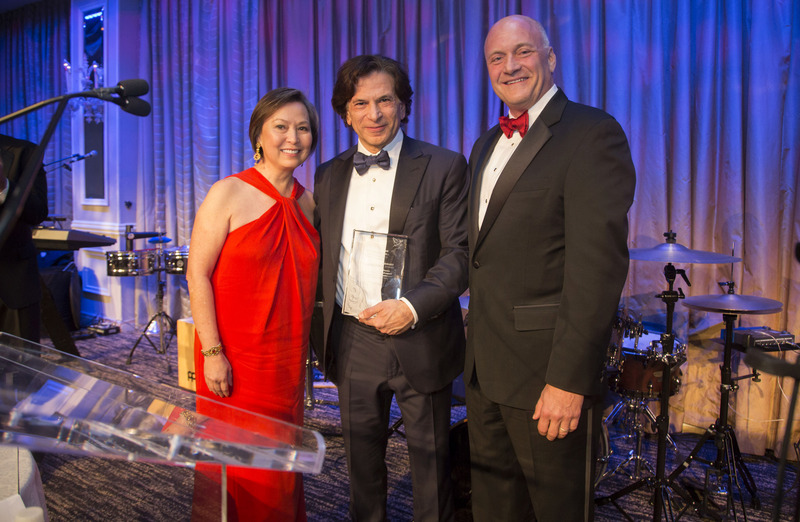 Daniel E. Straus was presented with the Spirit of Healing Award at Holy Name Medical Center’s Annual Founders Ball, which raised a record-setting $1 million. Fort Lee, NJ —The Holy Name Medical Center Foundation hosted the 2016 Founders Ball at The Pierre Hotel in New York, NY, on December 3rd, to benefit Holy Name Medical Center’s programs and services. More than 700 friends, benefactors, dignitaries and physicians attended the annual event, which raised over $1 million – the largest event in the Center’s history, both in attendance and financial support. During the evening’s tribute, Daniel E. Straus, President & CEO of CareOne, LLC was presented with the Spirit of Healing Award. The 2016 Founders Ball was chaired by Angelica Berrie, Ilan Kaufthal, and Elizabeth Straus. Angelica Berrie, President of The Russell Berrie Foundation, was the recipient of the 2015 Spirit of Healing Award. Ilan Kaufthal is Chairman of East Wind Advisors and Elizabeth Straus, Daniel E. Straus’ daughter, is Executive Vice President, CareOne, LLC. Steve Adubato, PhD, Emmy Award-winning Anchor Thirteen/WNET (PBS) and NJTV (PBS), served as Master of Ceremonies. The event also featured a musical performance by Max Weinberg, famed drummer of The E Street Band and Max and Friends, and his band. For 30 years, The Holy Name Medical Center Foundation has helped raise millions of dollars for new state-of-the-art medical facilities including The BirthPlace, The Sister Patricia Lynch Regional Cancer Center, The George Pitkin, MD Emergency Care Center and The George and Amy Newman Cardiac Diagnostic Center. “In celebration of 30 years of philanthropy, we are deeply grateful for the generous support of our donors, which significantly helps Holy Name Medical Center provide the best medical care to our community,” said Celeste A. Oranchak, VP, Development and Executive Director of the Holy Name Medical Center Foundation. The event was made possible by a number of major sponsors, including The Russell Berrie Foundation, CareOne, LLC, and the Alfiero and Lucia Palestroni Foundation. All proceeds from the Annual Founders Ball benefit Holy Name Medical Center programs and services. To learn more about the Holy Name Medical Center Foundation, call 201-833-3187 or visit holyname.org/foundation.